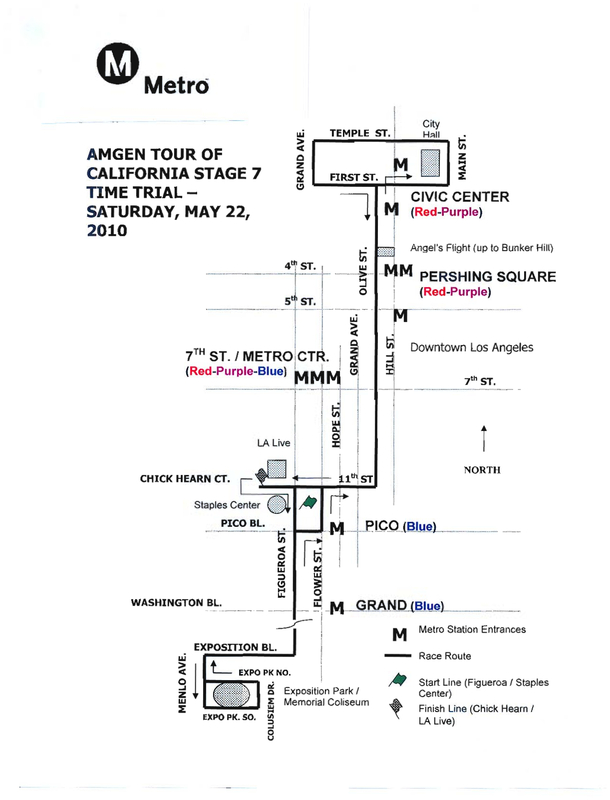 The eight-stage Amgen Tour of California bike race began Sunday in Northern California and will reach downtown Los Angeles on Saturday with an individual time trial through the city. Brett Lancaster, of Australia, holds the overall lead after stage two; the racers are today tackling the 113-mile stage between Santa Cruz and San Francisco. Go Metro to see legendary cyclist Lance Armstrong participate in the 2010 Amgen Tour of California in downtown Los Angeles, Saturday, May 22, and take advantage of the five Metro Rail stations nearby to see the bicycle race along downtown streets. The public event is free. 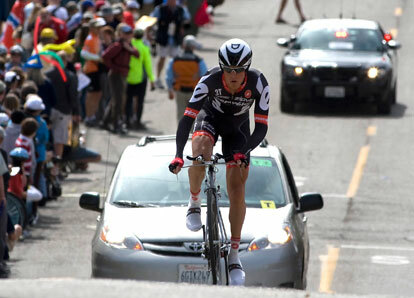 Billed as the largest cycling event in America, the 2010 Amgen Tour of California -in various California cities- is a Tour of France-style cycling road race that challenges the world’s top professional cycling teams to compete along a demanding course from May 16-23. On Saturday, stage 7 of the race will be in Los Angeles. Metro will add extra capacity to its trains since the subway and light rail trains are the best option to see the Amgen Tour without the hassle of driving and spending money on gas and parking. The Metro Rail stations are within walking distance of some of the hot spots along the 10.5 mile circuit. The five stations closet to the cycling race course include the Metro Blue Line Pico/Chick Hearn Station just one block east of Figueroa Street and two blocks from LA Live / Staples Center, the beginning and end of the race. The Grand Avenue station on Washington Boulevard is one and a half blocks east of the Figueroa Street race course. The Purple/Red Line stations closest to the race are 7th St./Metro Center Station, two blocks west of the Olive Street race course from via the Hope Street. exit, Pershing Square Station, one block east of Olive Street via either the 5th or 4th Streets exits and Civic Center, with exits on both sides of the race route on First Street. Meanwhile, Metro will detour 57 bus lines along the 10.5 mile race circuit beginning at 5 a.m. Saturday, May 22. The Metro bus lines impacted by the detours will include 2, 4, 10, 14, 16, 18, 20, 26, 28, 30, 31, 33, 35, 37, 38, 40, 42, 45, 48, 51, 52, 53, 55, 60, 62, 66, 68, 70, 71, 76, 78, 79, 81, 83, 84, 90, 91, 92, 94, 96, 102, 200, 333, 439, 445, 460, 485, 487, 550, 603, 720, 740, 745, 760, 770, 794, and 910. For information on the 2010 Amgen Tour of California visit www.amgentourofcalifornia.com.